Tamarama SLSC's vision is to be a diverse and inclusive club, that's why each year we award financial scholarships to members of the community who may not be a position to join the club due to financial or social disadvantage. The club is also keen to welcome more Culturally Linguistically Diverse people such as recent arrivals to Australia. The scholarships will fund eligible people to become Lifesavers or First Aiders to patrol our beach and join our wonderful club. Scholarships range from $250 to $1000, with 1-5 scholarships available each year. 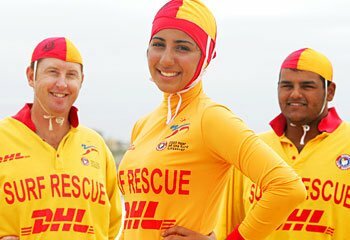 To be eligible for a scholarship, you must agree to be an active patrolling member by attaining the Bronze Medallion (BM) or the Surf Rescue Certificate (SRC), our entry level surf rescue qualifications for adults and minors respectively, or achieve the Senior First Aid (SFA) qualification. Tamarama has two BM/SRC and SFA sessions per 'summer' season commencing in October and February. If a scholarship is granted you must agree to participate in the 10-weeks of training for BM/SRC, or successfully complete a two-day course for SFA. If you or someone you know would like to be considered for the Kirsty Boden Scholarship, encourage them to email Matteo at vicepresident@tamaramaslsc.org to start an application or just to ask some questions about what's involved. You may be asked to complete a written application or an interview over the phone or in person. The scholarships are named after our club member Kirsty Boden who died in the London Bridge terror attack running to the aid of others. Kirsty was a fearless lifesaver and fearless in life, these scholarships will honor her memory.